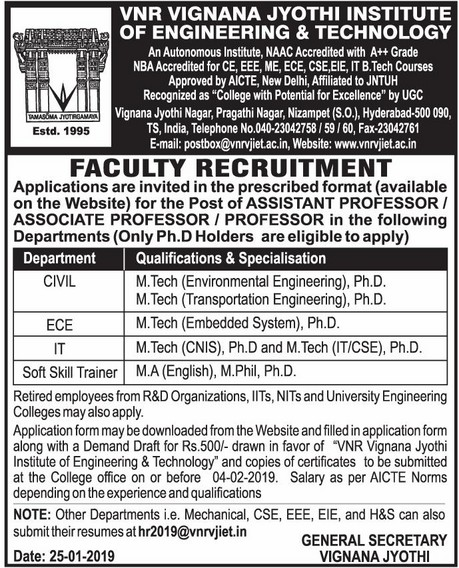 VNR Vignana Jyothi Institute of Engineering and Technology, Hyderabad has advertised for the recruitment of Teaching Faculty- Professor / Associate Professor / Assistant Professor / Soft Skill Trainers jobs vacancies. Interested and eligible job aspirants are requested to apply immediately from 25th January 2019. Check out further more details below. How to Apply: Interested and eligible candidates are requested to send application (only for Mechanical / CSE / EEE / EIE / H & S) along with CV, copies of certificates and recent passport size photo to the email address given below. Other departments such as Civil / ECE / IT / Soft Skil Trainer should send application in prescribed format downloaded from college website along with a Demand Draft Rs.500/- in favour of VNR Vignana Jyothi Institute of Engineering and Technology, along with copies certificates to the college office address provided below.